It's time once again for a dip into the archives of past TV Guide articles. I mentioned my current (un)employment situation a couple of weeks ago, which means that the Hadley TV Guide collection is undergoing its own type of shutdown. Hopefully this series of reruns will only last a couple of months (if you'd like to loan an issue for the cause, please email me), but in the meantime please enjoy a look back at issues we've enjoyed in the past. As always, the Monday TV listings feature will be new! 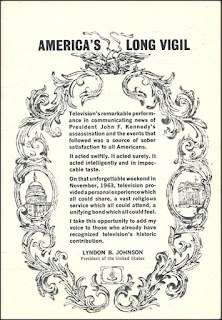 I always knew where my mother kept the TV Guide, and eventually I tucked it inside the front cover of another book she’d bought, William Manchester’s The Death of a President, one of the best books on the JFK assassination. As I grew older and more interested in history – this was, after all, the seminal news story of my young life—I’d pull the book down from the shelves from time to time and read bits and pieces of it. Never from cover to cover, oddly enough; although I’ve read the book several times since then, I don’t think I’ve ever read it straight through. Anyway, my interest soon focused on the television coverage, and I probably read that special section dozens of times, trying to imagine what it must have been like to see it as it happened. * And in the course of reading that section, I’d also read through the programming listings. Eventually, once I knew the JFK section forward and backward, my prime focus became the programs. It was like opening a door to a new world, the world of the past—not the distant past, but my past. Some of the listings rekindled memories. Hey—I remember when Combat! was on! And Whirlybirds! And Sea Hunt, and The Twilight Zone! I remember those sinister, silhouetted figures on Kraft Suspense Theater! And the Saturday morning shows, like Alvin and Fireball XL-5, and that episode of The Jetsons when George and Mr. Spacely go to the robot football championships (in a domed stadium, no less! I used to watch Mr. Wizard and G-E College Bowl! And Ted Mack and his Original Amateur Hour – round and round she goes, and where she stops, nobody knows! But the fact is that she did, and here we are. 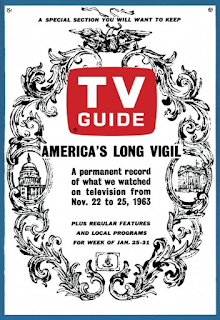 Myself, I think this TV Guide instilled the curiosity in me, the wonder at what was, the desire to recreate the past and recapture its memories. Even today, when I flip through the pages, I'm assaulted with those memories. 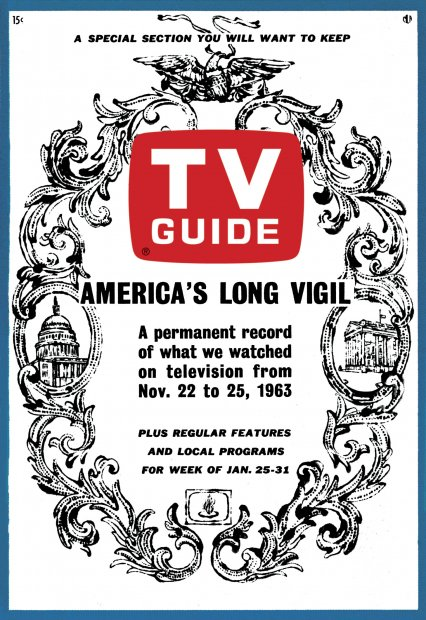 Memories of the shows, memories of the early 60s—and memories of reading about them in this TV Guide. Sometimes it's that memory that's best of all. There was a thread at the Radio Discussions message board asking for reader input on "Once great stations that have fallen from grace." The examples were too numerous to mention here, but they all seemed to have a common denominator: the disappearance of local programming. Think about it: many TV stars got their start on local variety programs. 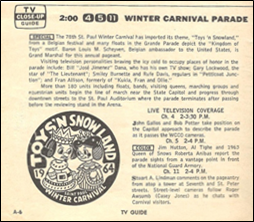 There was coverage of local events, local sports shows (which I discuss below), and those marvelous kids' shows that so many of a certain age can remember. There were local movie hosts, afternoon talk shows, and news commentary. To a great extent, those are all gone. The reasons are complicated and would fill several books, but the end result has been a loss of connection between local stations and their communities. 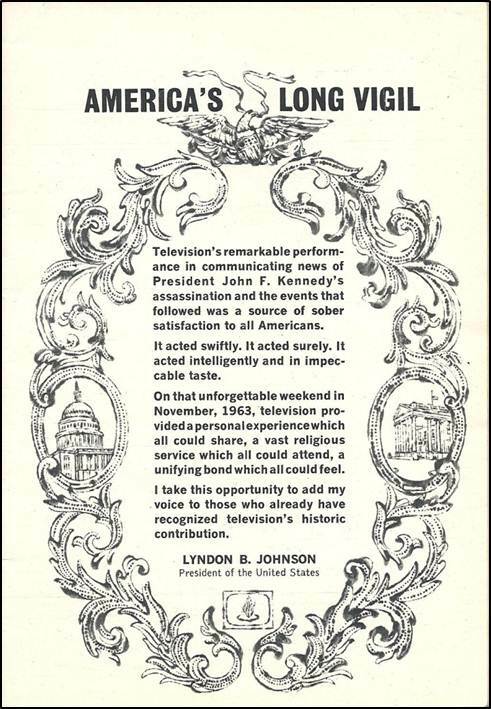 The early pioneers of television saw the medium as one way to connect people, to bring together shared interests; too often, it has had the opposite effect. We may all live in one big world, connected in so many ways, but we're still in our own separate cubes, and the medium that has brought us closer together has left us further apart than ever. 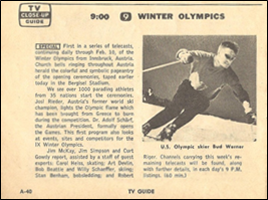 The 1964 Winter Olympics were the first broadcast by ABC; over the next 24 years the network became synonymous with the Olympics, showing either the Summer or Winter Games (and many times both) every four years, with their last hurrah being the 1988 Winter games in Calgary. Over that time, the Winter Olympics would expand to 16 bloated days*, and ABC's coverage increased to 94.5 hours—for which they paid $309,000,000. 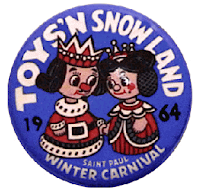 But there was a lot of local bowling as well; WCCO, Channel 4, had a show called Bowlerama that aired at 12:15 Sunday afternoon, and another called All Star Bowling, which was at 10:30 Sunday night, following the late local news. These live shows pitted various local bowlers against each other, originating from bowling lanes throughout the metro area, most of which don't exist anymore. There's no description for Bowlerama this week, but All Star Bowling was broadcast from my home lane, Diamond Lake Lanes in South Minneapolis. I wasn't a big bowler, although I enjoyed watching on TV, but I did roll a few frames at Diamond Lake—I think the last time was around 1988 or so. Alas, it too has gone, replaced by a grocery store and a generic strip mall. In last week's issue we looked at a preview of possible new shows for the upcoming fall season, and there's a similar article this week. There seem to be a few more hits than misses in this issue—perhaps the networks were farther along the line in choosing their fall shows. CBS, for example, touts a new sitcom starring Bob Denver and taking place in Hawaii - Gilligan, which would acquire an Island somewhere down the line and become an enduring cult favorite. CBS also introduced The House, a political drama with Richard Crenna, which would wind up as Slattery's People and go on to critical acclaim and mediocre ratings. The Jones Boys, starring Mickey Shaughnessy, which was called one of CBS's "top projects," never even made it to the IMDB. My problem here is that I have actual memories of a lot of this. - I wonder if you know anything about A Case Of Libel, the play being excerpted on Ed Sullivan this week. Henry Denker based his play on a chapter of Louis Nizer's memoir My Life In Court: specifically the libel suit brought by war correspondent Quentin Reynolds against Westbrook Pegler, a notorious ultra-right-wing commentator of the '40s and '50s. There's no doubt where any of the principals here are coming from, even though Denker changed all their names (when the play appeared, all were still living). Here, Van Heflin is playing 'Robert Sloane', the Nizer character, while Blackmer is 'Boyd Bendix', or Pegler. I'm guessing that they're doing the cross-examination scene from Act II, which sticks closely to the trial transcript; in the real trial, that cross by Nizer of Pegler blew a major hole in the latter's career. - ABC did one around 1969-70, with Heflin repeating as Sloane, and Jose Ferrer as Bendix. - At the outset of cable, Showtime (I think; correction welcomed if needed) produced one in Canada, with Ed Asner as Sloane and Daniel J. Travanti as Bendix; I've got that one in the DVD Wall. - I also have a copy of the play, which I got Ed Asner to autograph at a show a couple of years back. This play was awfully powerful stuff when I saw those TV versions; I wonder how it played in more placid (comparatively) 1964. - Looking at those fall prospects, it occurs to me that The Healers might have been a working title for what would become Breaking Point when Fall came around; the pilot was "crossovered" from Ben Casey come September. - You know, I thought I had this issue in my stacks (piles? ), but I can't seem to find it. This was a memorable Guide in my house as well, Mitchell. Wish I still had the original. That Guide (along with the memorial JFK Life magazine) was required reading for a 10 year old growing up in a strong political home. I still have this TV GUIDE. My mom wouldn't let me buy TV GUIDE because she knew I would want to keep them all, but we kept this one because it was about the JFK coverage. My dad would be one of the folks watching the Pro Bowlers Tour. He also watched CANDLEPIN BOWLING every Saturday afternoon on WHDH Channel 5 in Boston. Ah, yes, the Olympics back when Jim McKay hosted and we weren't subjected to a bloated production number on opening and closing nights. The BELL TELEPHONE HOUR was a fascinating show. Sometimes it was music, sometimes drama, usually an annual Christmas show. Bell Telephone also sponsored the Bell Science series, fondly remembered by generations of 1960s kids who saw the specials in school, like "Our Mr. Sun."